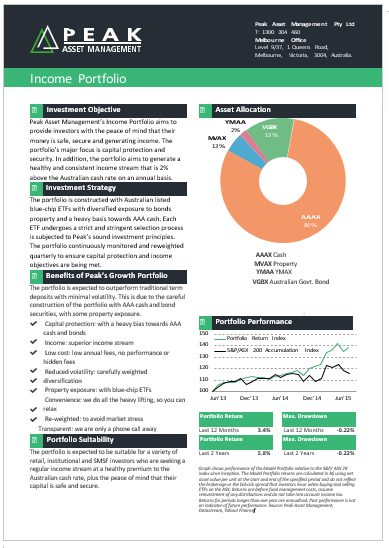 Peak’s Model Portfolios aims to outpace the S&P/ASX 200 Index. Each portfolio is structured for lower overall volatility and drawdowns compared to underlying shares, driven by asset diversification and careful portfolio management. The Income Portfolio is for investors that are seeking peace of mind that capital is safe, secure and generating income above the Australian Cash Rate. We have developed a structured and comprehensive methodology. It blends qualitative and quantitative inputs from the bottom up and the top down. Our actively managed and periodically re-weighted portfolios challenge the status quo and provide investors with adequate diversification, excellent risk management while achieving superior returns. Our investor community throughout Australia and around the world trust us because of our track record in wealth creation. We understand that investors need transparency and customised portfolio management services to be successful. We utilise Exchange Traded Funds (ETFs) for global diversification across all asset classes and sectors. With the ASX only comprising 2.3% of the global indices, ETFs have you looking at the big picture. We are driven to serve our community of investors and provide superior returns over the long term. This drive stems from the desire to harness the power of relationships that are built on trust. Each portfolio is tracked in real time via our world-class trading platform, so you can get live access to your portfolio on any device. This is coupled with on demand portfolio reporting, designed to save you valuable time. We construct, manage and re-weight your portfolio as if we are investing our own money. We invest right alongside you, so we are with you for each step en route to the peak of financial markets. 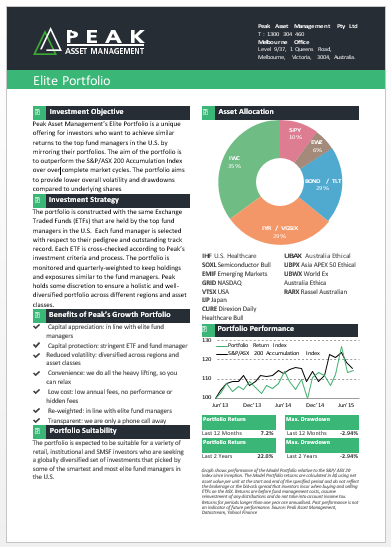 Peak’s Elite Portfolio is a unique offering for investors who want to achieve similar returns to the most elite fund managers in the U.S. 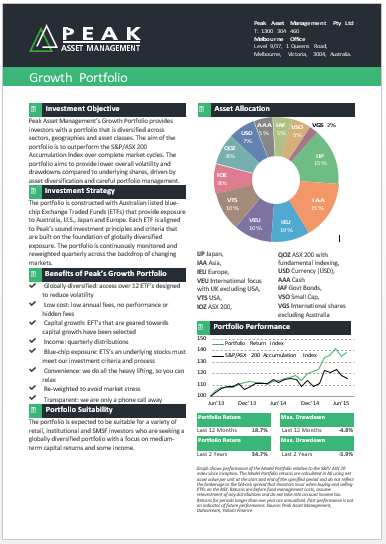 The portfolio is constructed and reweighted with the same ETFs that are held by the top fund managers in the U.S.
Peak’s Growth Portfolio aims to provide lower overall volatility and drawdowns compared to only holding shares, driven by asset and region diversification with careful portfolio management. The portfolio is constructed with ETFs that provide exposure to high quality, blue chip shares in Australia, Japan, and Europe and the U.S.
Peak’s Income Portfolio aims to provide investors with the peace of mind that capital is safe, secure and generating income. The portfolio is constructed with ETFs that provide diversified exposure to bonds and property, with a strong basis bias towards AAA cash. Peak’s Ethical Portfolio is constructed with hand-selected ETFs that follow themes around sustainability, environmental awareness, workplace rights and health. 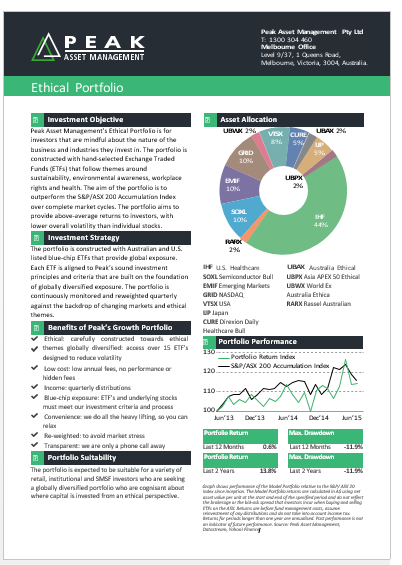 Each ETF is aligned to Peak’s sound investment principles against a backdrop of predefined ethical themes.